This book is the first ever collection of scholarly essays in English devoted specifically to the theme of the expression 'son of man'. It describes the major competing theories which have addressed questions such as: What is the original Aramaic expression which lies behind the Greek phrase, and what was its original connotation? How do the gospel writers use the expression 'son of man'? Is it a Christological title, pregnant with meaning, much like the titles son of God, Christ/Messiah, and son of David? Is it used as a way of designating Jesus as a human being of unique redemptive significance? Or does it rather originate in a nuanced use (obscured in Greek translation) of an Aramaic expression used in place of the first person pronoun, as an indefinite pronoun, or for generic statements about human beings? Larry Hurtado and Paul Owen have brought together contributing scholars on the basis of their expertise in Aramaic, historical Jesus research, the son of man debate itself, and related fields of research. From the myriad works on the Son of Man, this collection stands out as one of the most important. 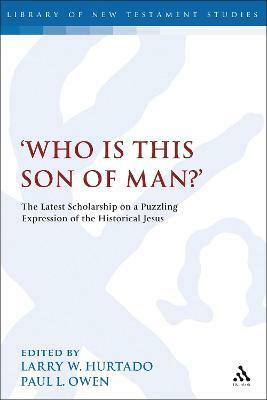 A must read for anyone engaged in research related to the historical Jesus, Christology, or early Christianity. Its editors are to be congratulated for such stimulating essays. * Journal of Evangelical Theological Society * Overall, the scope and focus of the book are such that it will be useful to advanced students and academics in their field ... [T]he monograph does offer great insights and moves he debate forward ...The book is recommended for the advanced readers who are interested in the `son of man' expression and who wish to know more about the competing hypotheses put forth concerning he expression. * Studies in Religion/Sciences Religieuses * All the contributors made a great effort to present the debated issues with much possible clarity, using good and accessible language ... Ultimately, Who Is This Son of Man? is the book meeting all the standards of well-founded and methodologically sound biblical analysis and as such it is worth recommending both to the scholars and to the students of biblical classes. -- Marcin Kowalski, Institute of Biblical Studies, Poland * The Biblical Annals * Reviewed in Journal of Jewish Studies. Larry W. Hurtado is Professor of New Testament Language, Literature and Theology at University of Edinburgh, UK. Paul L. Owen is Chair and Associate Professor of Biblical and Religious Studies at Montreat College, USA.